Adiem Homestay is a cute, family-style home-stay in Nasik. If you’re looking to explore Nasik and its scenic vineyards, this is a cosy, rustic option that promises to be your home-away-from-home! Getting here by road should take no longer than 5 hrs (219 km). The bungalow is close to Sula Vineyards, so bookmark it for the next time you decide to hit up SulaFest! Adiem Home-stay is a bungalow belonging to the Chougaonkar family, located in a green pocket tucked away in the midst of concrete buildings. 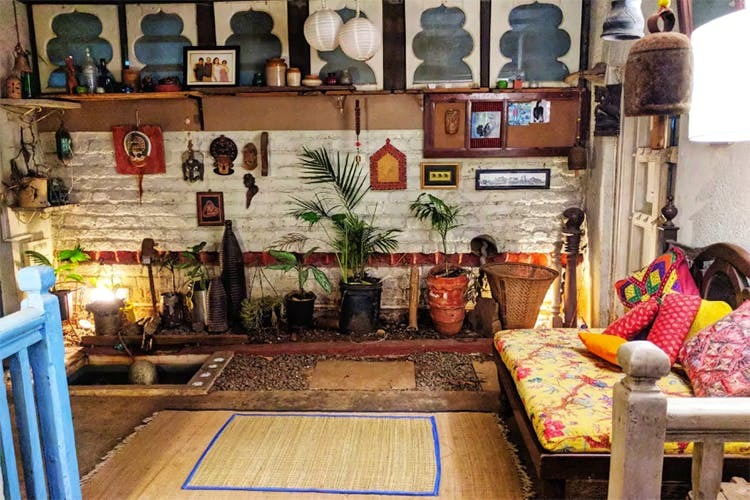 The bungalow itself is really charming – made with regional materials like terracotta tiles and Mangalorean roof tiles, with plenty of open spaces and even a courtyard with a fish pond! Two of their three bedrooms with en-suite bathrooms are allotted for guests (one even has a balcony), and you can also choose to ‘sleep under the stars’ and pitch your tent on their terrace. For recreation, you can test your gardening skills in their organic garden, feed the koi fish in the pond, curl up with a rare book in their living room, or play board games. There is no TV, as the family believes in, “communication, deep conversations and making memories with people” – but you will have access to WiFi. There’s also a small BBQ which you can use to have a candle-light dinner within the courtyard. The food here is farm-fresh and organic, served in the regional style of cuisine. Comfort, character, and charm are what await you at Adiem Home-stay! Book your room here or here. They have pets, so keep that in mind. The cancellation policy is strict, so make sure you read the fine print before booking online. There is street parking available, if you decide to bring your own car.